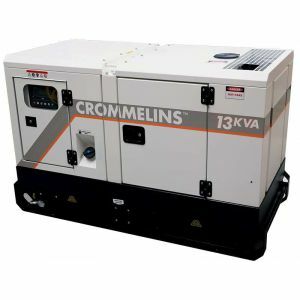 Crommelins have put the big brand names you can trust together and now offer standby generator sets powered by Japanese Kubota water cooled diesel engines, Stamford alternators with Deep Sea controllers all in a heavy duty compact silenced canopy. This range is ideal for most of those work site, home and solar power backup needs with each model having switched single and three phase outlets for instant use, as well as a pre wired socket outlet for ATS (Auto transfer switch), 2 wire remote plug and hardwire facility all making for simple use and installation. This 11,200w max. output single phase diesel powered standby generator with Deep Sea controller is ideal for most of those worksite, home and solar power backup needs.